Tweeting In Church: German Protestants Are Encouraged To Tweet During Services : All Tech Considered As it celebrates 500 years since Martin Luther and the Reformation, the Protestant church in Germany is turning to social media to reach those too busy to attend. Worshipers at the Walloon Reformed Church of St. Augustine in Magdeburg, Germany, participate in a service where the congregation is encouraged to tweet about the liturgy and share their prayers online. In Germany this year, the Protestant church is celebrating 500 years since Martin Luther brought about the Reformation. Today, as the number of churchgoers dwindles, the clergy is turning to new media to appeal to those with little time to attend worship in person. In the eastern city of Magdeburg, the monotone peal of a single church bell calls a modest flock of parishioners to evening prayers at the Walloon Reformed Church of St. Augustine. As the faithful file into a High Gothic church where Martin Luther once delivered a sermon, most fumble around in handbags and pockets, looking for their cellphones. But instead of dutifully switching off their phones and putting them away on this Friday evening, these 40 or so churchgoers take a pew and bow their heads over their lit-up devices as if they were prayer books. This is a Twitter service, where the congregation is encouraged to tweet about the liturgy and share their prayers online. Pastor Ralf Peter Reimann says it's an experiment. He believes that social media can help the Protestant church retain and even gain followers, even in today's increasingly secular society. "There are lots of people who live online," he says. "We want to include these people and offer them to participate in a way that's comfortable to them." While Reimann preaches from behind the lectern, a chorus of young parishioners perching in the choir stalls tweets about his sermon. 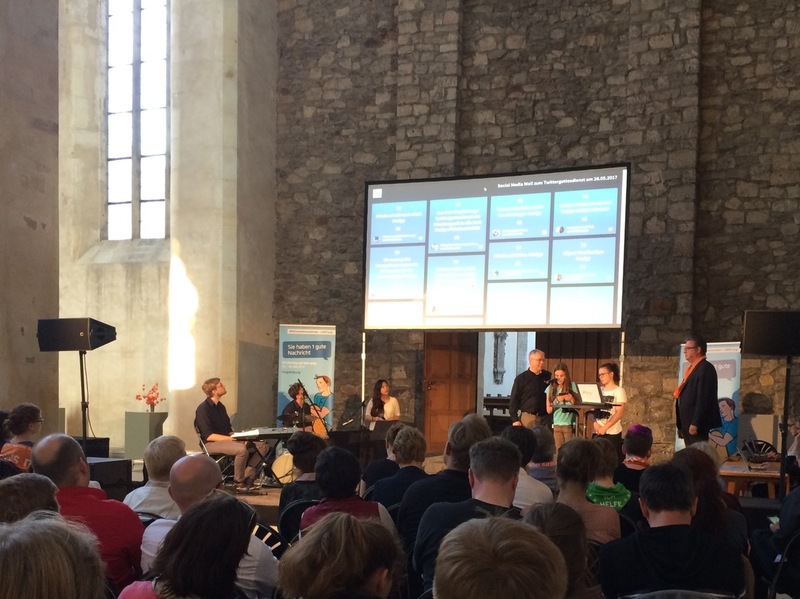 Above them, a large screen displays a hash-tagged feed which, in real time, shows tweets coming from both within the church and from around Germany. "Luther talked about the priesthood of all believers," Reimann says. "So if you use social media, it's not only the pastor communicating on behalf of the church, but Christians communicating among each other." Although such Twitter services are yet to catch on, embracing the latest media trend is nothing new for Protestants. Five-hundred years ago, when Martin Luther first protested against corruption in the Catholic Church, it was the then relatively new printing press that helped his challenge to papal authority to "go viral." Luther's supporters printed his radical ideas in pamphlets. Cheap to produce and easy to distribute, these pamphlets fostered public debate. Ulrike Zitzlsperger, a professor of German studies at the University of Exeter in England, says the 16th century pamphlet was the social media of Luther's day. "I think the parallels with the use of Twitter today are really strong," Zitzlsperger says. "You've got a topic that engages not just an educated public but really the wider public, the lay people. Everybody has a say." Luther's followers shared these pamphlets and responded to them by printing their own. These Twitter-like discussions spread so rapidly that the Catholic Church could do little to censor what it called heresy. Today though, it's no longer dissent but disinterest that threatens the Christian church in Europe. Back in Magdeburg, the Twitter service is in full swing. Messages from around Germany, where dozens of others participated, are displayed on the church's interactive screen in front of the altar. Some posts are encouraging, like the one from a Twitter user who tweets in German, "We all make mistakes. God will show us the right way." Some users share their private prayers, like one who posts: "I pray for the unborn child in my belly and that it is blessed with good health." Other users are less convinced. "Sorry, this is too hectic," one writes. "I go to church to find inner peace. I'm signing off." It's also too much for 86-year-old Ingeborg Brunner, who tiptoes out of church before the Twitter service is over. Brunner doesn't own a smartphone, so she feels somewhat left out. "It was certainly interesting, but it's not my cup of tea" Brunner admits. "I'm a little old for Twitter. I prefer a proper service, when we get to sing hymns." While Brunner says she's pleased the church is appealing to the digitally devout, regular churchgoers like her would rather sing than tweet. After all, congregational singing is another major legacy of the Reformation.